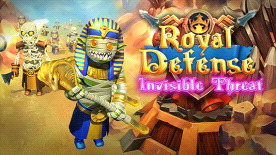 Royal Defense - Invisible Threat is a Tower Defense game for PC, mobile and other platforms. Follow the exciting story of the dwarven kingdom's eternal struggle against the troll hordes, who want only to crush the dwarves and claim their territory. In-game store, for various upgrades.